By comparing radar images of areas on Titan to those of Earth's deserts, scientists have identified two distinct types of sand dune on Saturn's largest moon – and discovered eroded structures that indicate that Titan's climate may have once been very different. Titan is an intriguing moon, particularly for planetologists. It is the only natural satellite in the Solar System to have a dense atmosphere containing methane, a geologically active surface, and numerous surface lakes and seas. The moon's thick atmosphere forms a permanent haze that obscures it from visible view. Instead, to 'see' the moon's surface we rely on radar devices such as the RADAR instrument on the Cassini spacecraft, which has been orbiting Saturn since 2004. RADAR operates at a wavelength of 2.2 cm (Ku-band), and can be used as a synthetic aperture radar (SAR), a scatterometer, an altimeter or, in a passive mode, a radiometer. In its study of Titan, it has revealed rivers, seas and lakes of liquid methane, and vast dune fields. Up to 17% of Titan's surface, mainly around the moon's equator, is covered with linear dunes, similar to those seen in deserts here on Earth. Previous observations of Titan's linear dunes have revealed that they are typically 1 to 2 km wide, 1 to 4 km apart, up to 150 km high, and over 100 km long. They are mostly oriented in an east-west direction, aligned parallel to Titan's equatorial winds. However, images of these alien dunes alone are not enough – and their 300-metre resolution too low – to allow scientists to fully explore and understand the morphology of the various sand dunes and structures on Titan's surface. To get a better understanding, a team of scientists used a method known as comparative planetology. 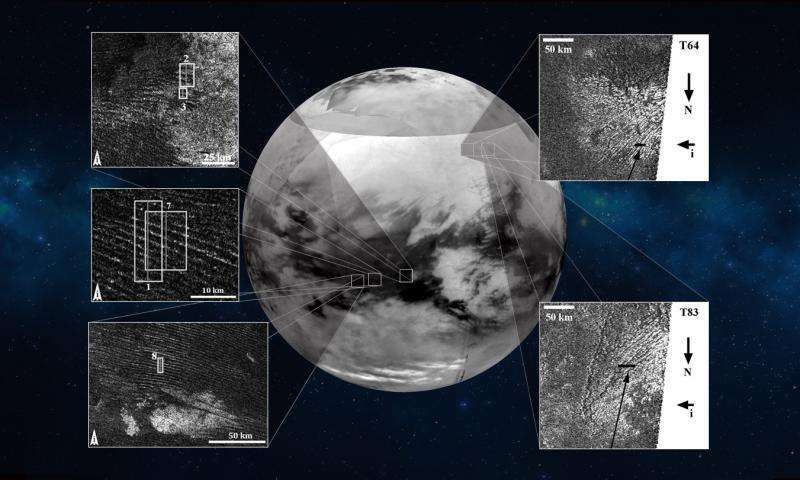 They studied radar images of features found here on Earth, taken by the Earth-orbiting TerraSAR-X satellite, to infer more about those on Titan. "Comparing features on different planets is a very powerful approach," says Philippe Paillou of the Université de Bordeaux, France, lead author of the new study. "It helps us to understand the geology of regions we can't directly access. Fieldwork on Titan is still a dream, but by using Earth's surface as an analogue we can learn huge amounts about Titan's surface, despite it being over a billion kilometres away." Paillou and colleagues analysed radar images of two types of surface structure seen on Earth: the aforementioned linear sand dunes, and a type of eroded structure known as mega-yardangs: wind-eroded rocky structures and ridges that form from the soft deposits found in old lake basins. While dunes are the result of winds moving and depositing material, mega-yardangs are instead created by wind erosion. "We used TerraSAR-X images of known linear sand dunes in Egypt's Great Sand Sea and Namibia's Namib Desert, and mega-yardangs in Iran's Lut Desert and Chad's Borkou Desert," adds Paillou. 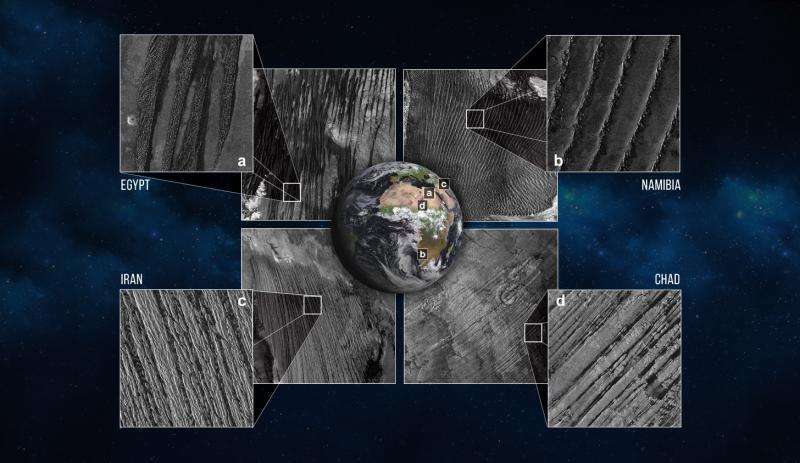 The TerraSAR-X images were of a far better resolution than those taken by RADAR, 18 m versus 300 m respectively, allowing the scientists to get a much better view of how radar interacts with geological structures on a planetary surface. The images were acquired by the satellite's X-band (3.1cm) sensor, the shortest wavelength available among radar satellites orbiting and observing the Earth, and the one most similar to RADAR's 2.2-cm Ku-band. By analysing how each type of dune and mega-yardang backscattered the satellite's radar signal, the scientists were able to build a simple surface scattering model that accurately reproduced the radar signals for each landform. The model used local topography data courtesy of NASA's Shuttle Radar Topography Mission (SRTM), and surface property estimates derived from field observations in Egypt. Regions within and between the linear dunes scattered the signal differently, as did the mega-yardangs' various ridges and erosion valleys. The scientists found they could accurately differentiate between bare (Egypt) and sand-covered dunes (Namibia), and between two types of mega-yardangs – young (Iran) and old (Chad). The scientists then applied their findings to Titan. Dunes in Titan's Belet Sand Sea, an equatorial region imaged during a flyby in October 2008, were shown to be linear but of different types: some were bare, like the Egyptian dunes, and others were sand-covered like those in Namibia. "Being able to distinguish between different types of dune is significant," adds Paillou. "It's important to know that there's more than one form of linear dune on Titan, to avoid false interpretations of radar images in the future." After exploring two other regions of Titan, imaged in December 2009 and May 2012, the team found bright features likely to be mega-yardangs, structures that are usually associated with ancient lake beds and basins on Earth. This is the first time these have been identified on Titan. The plentiful linear dunes spied around Titan's equatorial regions are thought to be made of tiny carbon-rich particles that 'drizzle' down from the thick clouds above, and are then blown around by the moon's winds. Yardangs, however, are thought to form from sediments left behind in ancient lake basins, which are then eroded over time by unidirectional winds. Because Titan's surface is very cold – roughly -180°C – its hydrological cycle is dominated by liquid methane and ethane, but the only regions of the moon's surface currently able to keep liquid methane stable lie around the polar regions. Although these areas are indeed studded with various lakes and seas, we do not see any existing lakes around Titan's equator, where Paillou and colleagues identified possible mega-yardangs. This implies that the moon's climate may have once been very different to what we see today. "Finding yardangs at mid-latitudes on Titan means that lakes might have existed there at some point in the moon's past," adds Nicolas Altobelli, ESA's Cassini-Huygens Project Scientist. "As they're certainly not there now, it's a strong sign for natural climate change. This just adds to the moon's intrigue – there's much more for us to explore." Dunes on Pluto? Can a nearly airless world have windblown dunes?